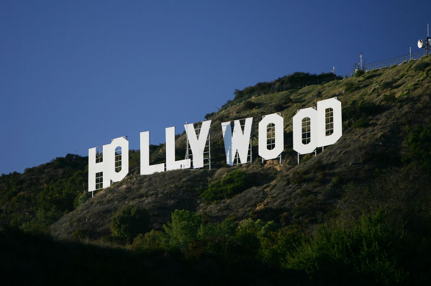 Hollywood is a district in Los Angeles, California and a name used to represent the motion picture or film industry in the United States. Hollywood was a small community in 1870 and became a municipality in 1903. It merged with the City of Los Angeles in 1910, and shortly after, the motion picture industry began to emerge. David Horsley established Nestor Studio, the first film studio in Hollywood, in 1911. It was located at the Blondeau Tavern building on the northwest corner of Sunset Boulevard and Gower Street. The first motion picture stage was built behind the tavern. The studio put out a one-reel drama and western every week. "One-reels" typically last about 11 minutes. They also produced a one-reel "Mutt and Jeff" episode weekly based on the popular comic strip of that time period. Other filmmakers soon caught on and started building studios in Hollywood. The location was ideal as it was close to Mexico and had a favorable climate for year round filming. Hollywood changed when the first movie with sound was released in 1927. This movie, The Jazz Singer, sparked what the film industry calls the "Golden Age of Hollywood" that lasted from the end of the silent era to the 1960s. In 1953, the volunteer president of the Hollywood Chamber of Commerce, E.M. Stuart, proposed to build the Hollywood Walk of Fame. The idea was to honor the artists who contribute to the entertainment industry. According to E.M. Stuart the Walk of Fame was to: "maintain the glory of a community whose name means glamour and excitement in the four corners of the world." In May of 1956 and the fall of 1957, four committees were established to represent the four different aspects of the Entertainment Industry at that time - motion picture, television, recording and radio. This committee selected some of the most prominent names in the industry. The walk of fame was completed in the spring of 1961 with the first 1,558 stars. To date, the Hollywood Walk of Fame has hosted over 10 million visitors and is a popular tourist destination. In the New Hollywood and Post Classical Cinema Era (1950 – 1980) there was a change in the methods of story telling. A new generation of film school-trained directors had been influenced by methods used in Europe in the 1960s. This was the era of movies such as Psycho and Rebel Without a Cause with twisted endings. With new technology the film industry is changing and allowing films like Avatar and Life of Pi to be created. Some of the most popular movies of 2012 were: Lincoln, Zero Dark Thirty, Moonrise Kingdom, Inception and The Dark Night. Who knows what will be created next!